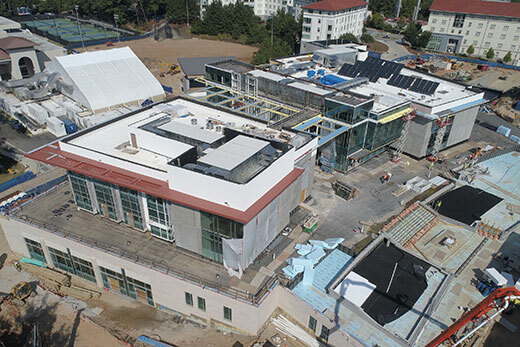 Construction is on schedule for the new Emory Student Center, which is slated to open in May and will provide dining options, recreational spaces, event locations and much more. What’s in a name? Quite a lot in this case, according to David Clark, associate vice president of Campus Life. The name “Emory Student Center” replaces the “Campus Life Center” designation for the capital project, which remains on schedule to open in May 2019. But the facility, according to Clark, is much more than an impressive “bricks and mortar” structure. Input from students, along with other members of the campus community, was a key element in planning. One result is that the facility co-locates some of the university’s most student-serving departments and student-centric amenities, including lounge and other common spaces, recreational spaces, dining options and a convenience store. The Emory Student Center encompasses approximately 130,000 gross square feet, about 60,000 more than the Dobbs University Center (DUC), which it replaces. The new facility is intentionally designed to be welcoming to all members of the Emory community – providing dining, fostering collaboration, accommodating large events and meetings, and inspiring a uniquely Emory image and character. The Emory Student Center also offers a range of naming opportunities for donors, the ultimate being the name of the facility, which requires a significant philanthropic investment. Although it may be named for a donor, according to Clark, the facility will retain its essential focus on building community across the university’s campus. Learn more about the newly designated Emory Student Center.